Spray For Life® premium oral liquid supplement sprays are the most technologically advanced and best performing on the market today. All Spray For Life® supplements offer optimum health & nutritional benefits backed by our proprietary state-of-the-art technology. Our NanoMist® sprays are packaged in convenient pre-metered, non-aerosol containers that easily fit in your purse or pocket. It’s simple to use our products. Simply spray these fast absorbed supplements in the mouth (typically 3 sprays twice a day), hold for 20 seconds and then swallow. Our NanoMist® formulas are great tasting and address the 40% of the population that have a difficulty swallowing pills, tablets and gel capsules. The superior benefits of our patented NanoSynergy technology make a significant difference for our customers. Our NanoMist® Spray supplements have shown they have more rapid, uniform and complete absorption than pills. The recent breakthroughs we have achieved with our unique NanoSynergy technology have changed the supplement industry. Our proven process creates vitamins and supplements with exceptional stability, longer shelf life and great taste ... that actually work. We manufacture our products for you in a “10,000 Class Cleanroom” rated processing facility, using the highest quality, premium grade ingredients. 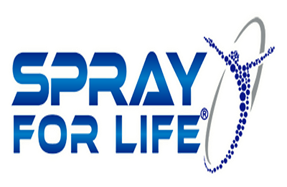 All of our Spray For Life® products are natural and are free of synthetics, sugar, binders, fillers, wax, shellac, talcum and animal gelatin. In addition, they contain no yeast, wheat, corn, soy, gluten, salt, diary or artificial flavors, colors and preservatives. Toll Free: (877) NSW-NANO (679-6266). Appropriate supplementation with a synchronized vitamin B complex formula of this nature and finding as seen in clinical studies conducted at major institutions around the U.S., show patients' had improvement, particularly in several required nutritional pathways in the body and several deficiency syndromes. Melatonin is a powerful antioxidant and should be part of your daily regimen. Customers who have used other brands of melatonin told us that Spray For Life’s Nano Melatonin is their #1 choice … because it really works for them. Once again, our proprietary NanoMist® formula differentiates us from the competition. It’s well documented just how vital CoEnzyme Q10 is to just about every function in your body. CoQ-10 has been recognized n recent years as a vital component of a sensible supplementation program. Spray For Life’s Nano CoQ-10 formula has been custom formulated to optimize the key ingredients experts recommend for a healthy lifestyle . Our NanoSyzed™ particles have been independently verified by reputable third party labs and have validated our “nano” claims. When you add “nano” to your supplementation program, you are dramatically increasing the bioavailability and absorption. Multi Vitamin - Helps bridge the nutritional gaps found in most people's diets. A powerful multivitamin has been a part of most people’s daily supplementation program. The problem is, the typical large particle size found in most vitamins make it difficult for our bodies to use the great nutrients. Spray For Life’s Nano Multivitamin has solved the particle size challenge and delivers a convenient, potent spray formula that you can take anywhere and supercharge your supplementation efforts. A powerful formulation consisting of a proprietary specialty blend of herbs, amino acids, and natural vitamin ingredients to assist in weight management. This product has been part of the Spray For Life family and has been working to successfully and safely assist our customers with their weight management issues for over 15 years. Nanofluidization™ NanoSyzing™, NanoMist®, Sweet & Slim®, and Spray For Life® are registered trademarks.